Head to head graphics comparison between all leading versions of Dead or Alive 6. Dead or Alive 6, quite surprisingly, is one of the leading games of 2019. We at GamingBolt loved it and awarded it a solid score of 9/10. But how does the game perform on the PS4 Pro, Xbox One X and PC platforms? Let’s check that out. To begin with, both the PS4 Pro and Xbox One X versions of Dead or Alive 6 offer two graphical modes. One is the Graphics mode and the other being the Action mode. The PS4 Pro versions renders Dead or Alive 6 in 1080p regardless of the mode you run the game on. However, the Graphics mode has better anti-aliasing and slightly better shadow quality, but overall, the differences between the two modes on the PS4 Pro is pretty miniscule. On the Xbox One X, things get a bit interesting. In Action mode, the game runs at 1080p, but in Graphics, the game runs in 4K resolution. So, in terms of image quality, Microsoft’s machine is clearly leading the race here. But what about performance? On the console front, we analyzed the game’s performance by taking some sample scenes from the game and running it through trdrop, an open source software. Note that this tool gives us a mere demonstration of the game’s performance, because an exact 1:1 representation of performance can only be provided by the developers themselves since they have access to vast of array of tools and profilers. The PS4 Pro version in both the modes runs at a steady 60 frames per second. This holds true even for the Xbox One X version when the game is running in Action mode, but as soon as you switch to Graphics mode, performance becomes uneven. The game runs in the range of 30s to 40s making the response time for controller input quite sluggish. There is absolutely no excuse to run a fighter at anything below 60 frames per second, and the Xbox One X’s Graphics mode is certainly no exception to that rule. We also tested the game on the PC. The developers recommend an Intel Core i7 8700 or better CPU, NVIDIA GeForce GTX 1060 and a shockingly high memory requirement of 16GB. On the graphical settings front, Dead or Alive 6 features a pretty barebones set of parameters. Besides the expected options for changing resolution and screen settings, the game offers players with only four other settings. These are Shadow Resolution for background and characters, Effect quality and Object Display. Dead or Alive 6 is no technical behemoth, it’s a decent looking game but there is no excuse for providing players with such a barebones PC graphical setting list. Our test PC includes a GTX 1080Ti, 16GB of GDDR4 memory and Ryzen 1700 CPU, and as expected, we had no issues running the game at a rock solid 60 frames per second. When compared against the PC build, it’s the Xbox One X version that comes close to matching it. However, it’s clear that the PC version excels with better texture filtering, anti-aliasing and overall better shader quality when compared against both the PS4 Pro and Xbox One X versions. As noted earlier, Dead or Alive 6 is the first major entry in the mainline series in almost seven years. 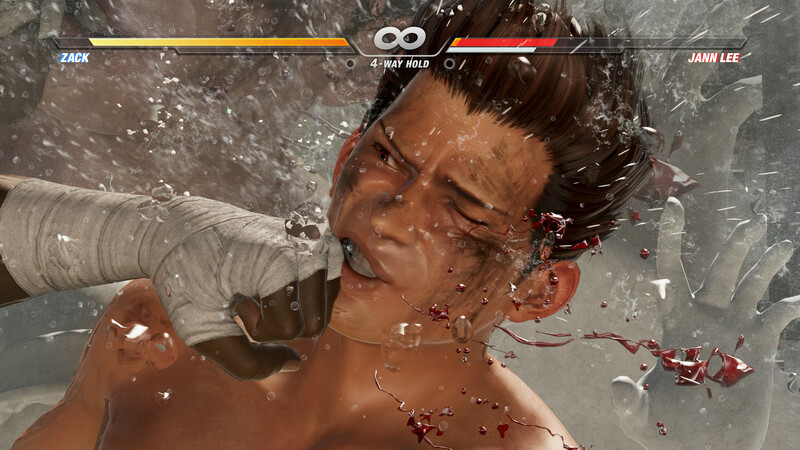 The previous game, Dead or Alive 5: Last Round, utilized the Soft Engine. However, this time around the developers are using a new in-house engine so that the series can be bought up to modern lighting standards. As mentioned earlier, Dead or Alive 6 isn’t exactly a game that will set your hardware on fire. Its adherence to physical based lighting for the most part is okay and the characters move more fluidly than they ever did before. But the engine seems like it’s stuck in transition between last generation and current generation. One look at the likes of SoulCalibur 6 or the more graphically intensive Tekken 7 will show you how much Dead or Alive 6 lags behind its material shaders and hair rendering solution. However, there are some noticeable improvements in the form of particle effects, skin shaders that allows for enhanced sweat and dirt effects along with cloth damage. So, overall, Dead or Alive 6, from a gameplay perspective is a strong entry in the long running fighting series. However, from a visual perspective, it’s a bit of a mixed bag. The PC version easily trumps both the console versions but between the PS4 Pro and Xbox One X, it’s a bit hard to decide given its weird implementation of graphical settings on those consoles. The lack of a resolution higher than 1080p on PS4 Pro and the Xbox One X’s unlocked frame rate in Graphics mode are both noticeable issues. If you are okay with a full HD resolution on the PS4 Pro and are able to pretend that a Graphics mode doesn’t exist in the Xbox One X version, you can’t go wrong with either platform.